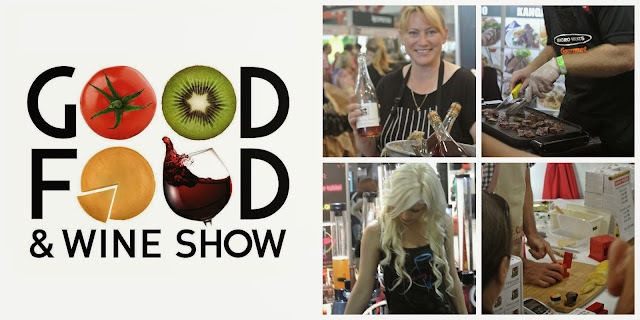 If you didn’t get to the Good Food & Wine Show over the weekend you missed out on a good time. This was the absolute perfect event to attend with a group of your closest friends. It was seriously the closest thing to foodie heaven I have ever seen. So many speciality items to sample and don’t even get me started on the wine! Oh, and all the cheeses... We hated that we had occupied so much room in our tummies prior to coming after we feasted our eyes on ....well the feast that was the Good Food & Wine Show. If you have never been on a wine tasting trip this was THE place to be. All the major wine regions of Australia were represented at this year’s Good Food & Wine Show- with entire sections of the massive hall at the Brisbane Convention & Exhibition Centre devoted to each wine region. We got to catch up with many of the wineries we frequented last year when we lived in Melbourne. I also was introduced to the Barossa Valley in South Australia. A few drinks later we became good friends. Come with an empty stomach and an open mind and indulge yourself in some of the yummy delights this beautiful country has to offer! Not to mention the CRAZY deals you can get at the Good Food & Wine Show. You can snag delectable food and wines for way cheaper than you would normally. I found everything to be very inexpensive at the show which made it even more appealing. General admission tickets to the show were $25. For only $3 bucks you can score a wine tasting glass and sample as much wine, beer, and spirits as you like! It even has the show’s logo on it which makes for a nice keepsake. In conclusion, the next time it swings into your town...GO! *AmeriAus was provided complimentary tickets to this event. All opinions expressed are our own.